After a year and a half hiatus from race riding, jockey E.T. Baird made a return to the winner's circle on Saturday afternoon at Arlington International Racecourse when guiding Good Bye Greg ($5.60) to victory for current leading trainer Larry Rivelli. It was Baird's 2,400th career win. Baird sent the Florida-bred son of Teuflesberg straight to the front in the 5½-furlong turf sprint and managed to keep Welovecandy at bay down the top of the stretch to win by 1¼ lengths as the 9-5 post-time favorite. Prior to his victory aboard Good Bye Greg, Baird's last win took place on December 16, 2016 at Tampa Bay Downs when he guided Back At The Ranch to a 3¾ length victory. The race was the seasonal bow for Good Bye Greg, whose last effort took place in Del Mar Racetrack's Damascus Stakes on Nov. 3 when fifth behind Americanize. He also took the Jeff Lynn Stakes over the Arlington all-weather surface last September. On Sunday, Baird went on to capture the opener aboard another Rivelli trainee Rivzinthehouse ($2.20) as well as the seventh race on Odachi ($4.40) for trainer Carlos Silva, his only two mounts on the day's card. 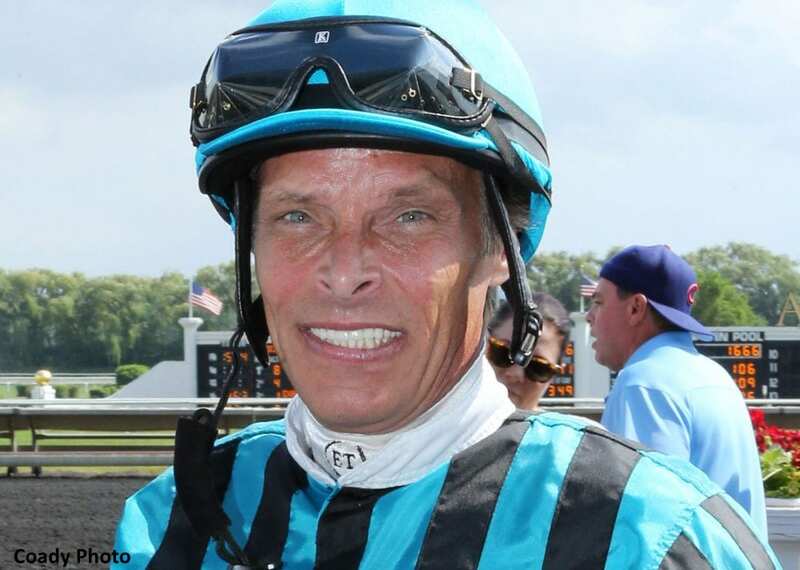 This entry was posted in People and tagged arlington, Arlington Park, Del Mar, E. T. Baird, good bye greg, jockey, larry rivelli by Press Release. Bookmark the permalink.